A couple of new live images portraying the LG G6 have been leaked today, and they are embedded below for your viewing pleasure. As you can see, this time around the phone is turned on, and we can glance at its Always-On Display functionality, showing the time, date, and battery capacity at all times. The rounded corners of the screen are in view here too, as are the minimal side bezels, the very small top bezel, and the slightly larger bottom one. People who love symmetry in bezels will unfortunately not dig the G6, that's for sure. The back is shiny, at least in this color version, and we once again get to see the dual camera arrangement and the fingerprint scanner that's situated underneath it. 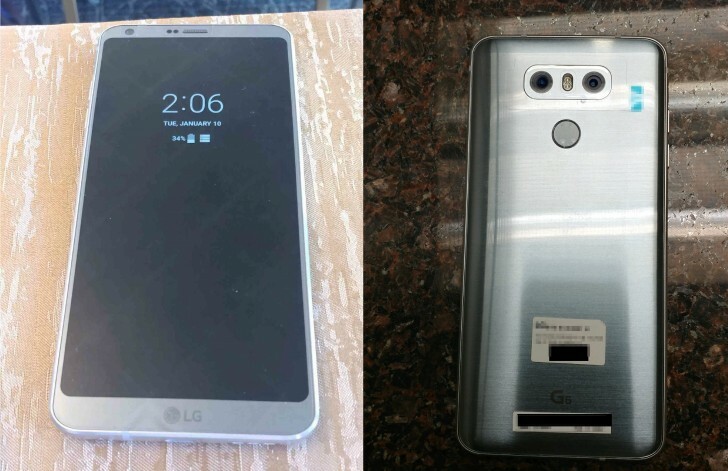 LG branding is on the front, while G6 branding is on the rear. The source of these shots has also thankfully shared a list of specs for the device. The G6 should thus come with a 5.7-inch display, the Snapdragon 821 SoC, 4GB of RAM, 32GB of expandable storage, and a 3,200 mAh battery. The screen's resolution will be 2,880x1,440, and the phone will also sport a quad-DAC and water resistance. It will be made official at a special event on February 26.